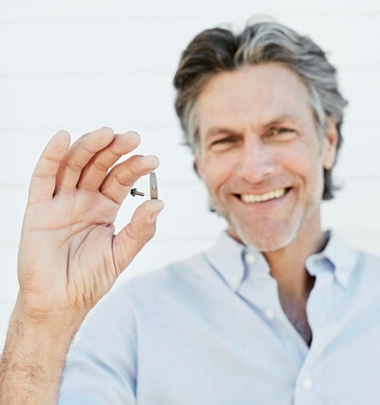 You've invested in hearing aids and now you're enjoying life with better hearing. Here are some care and safety guidelines to make sure your hearing aids work their best for many years to come. Turn off your hearing aid before you go to bed. This will avoid unnecessary battery drain when you're not wearing your hearing aids. If moisture builds up inside your hearing aids during the day, leave the battery door open at night to allow internal components to dry. This will prolong the life of your hearing aids. Excessive moisture may require a dehumidifier or silica-based drying agent that can be purchased from your hearing care professional. Keep your hearing aids away from heat. Refrain from placing them in your automobile glove compartment on warm days, near a radiator, or, in direct sunlight. Avoid using a hair dryer while wearing your hearing aids. It's also a good idea not to expose your hearing aids (or your ears) to extreme cold. Remove your hearing aids before using hair spray, spray perfume, shaving lotions, insect repellant or powders, as these items can damage or clog the tiny components in your hearing devices. Handle your hearing aids gently. When changing hearing aid batteries, hold your hearing instruments above a soft surface, such as a towel-draped table, in case you drop them. If your hearing aids hit the floor, or strike a hard surface, it's a good idea to let your hearing care professional make sure they're undamaged. Never immerse your hearing aids in water, or wear them while in a sauna, showering, bathing, or swimming. Protect your hearing aids from rain, as well. Do not try to lubricate hearing aid parts. Remove your hearing aids before medical procedures that utilize scanning, such as CT scans. Scanners found at airports will not damage your hearing aids. To clean your hearing aids, use cleaning agents approved for hearing aids, or, a soft, damp (but not wet) cloth. Avoid using alcohol or solvents to clean your hearing aids. A soft cloth should clean the receiver tube and receiver dome in your 'Behind-the-Ear' style hearing aids. If ear wax builds up on your ear domes or custom ear molds, and it's difficult to wipe away, see your hearing care practitioner for assistance. Use the correct battery size for your particular hearing aid. If you use zin-air batteries, let them sit outside of your hearing aid for a full minute after you remove the battery tab, and before you insert them. This will insure that the batteries charge fully and give you the longest possible battery life. Because modern hearing aids are so tiny, it's advisable to place them in a small container after you remove them. This may prevent knocking them to the floor, or putting an item on top of them. Keep your hearing aids out of the reach of children and pets! Please send any questions, comments, or appointment requests and we will get back to your shortly. We’d love to hear what you think!